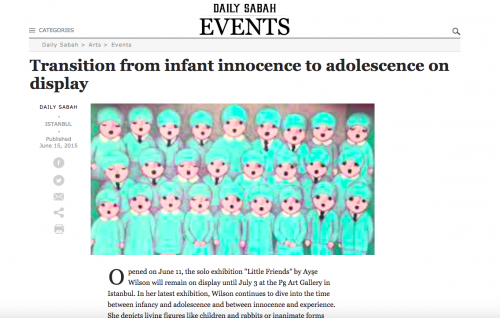 In her latest exhibition, Wilson continues to dive into the time between infancy and adolescence and between innocence and experience. She depicts living figures like children and rabbits or inanimate forms like donuts and rainbows to discover the disguised views behind ordinary forms. Wilson works either with photographs or imaginary figures. Her work portrays individual children or groups of children behind monochrome backgrounds. The subjects of Wilson's group compositions are wedding parties, school photographs, choirs, swim teams and rituals. In her recent work, the image of a wall in the background portrays the idea of division and separation. This raises the question of whether walls are used to fortify or restrict. In most of her work, Wilson prefers to leave the background ambiguous. In classical painting, this technique is called imprimatura, which means covering the canvas with a layer of initial color to provide reflection. To do this, the artist uses earth tones on a white canvas, creating a transparent and toned background that enables the artist to play more easily with light and dark. Wilson generally prefers to leave the basic imprimatura layer as it is. She believes that this application makes her work reminiscent of old-fashioned photographs, as the unfinished layer looks raw, spontaneous and vulnerable. Memory and nostalgia have a large role in Wilson's work. She hopes that her images will function in the same way, staying both in the foreground and background, similar to our memories.